I love a face with character. When we erase age we eliminate all that it took to get us this far. It's a weathered face of experience, perception and happiness; it's a beautiful face. This is an absolutely wonderful photo. This guy is so full of life. Great photo! i love the way his eyes are smiling too. the best accessory that money can't buy! What a shot. kind eyes. dapper w/ his hat! What a wonderful face! Great shot. I love your pictures of 'real people' (the others are real, too, but you know what I mean…). My first photo book was Richard Avedon's 'In the American West'. Although he is relaxed and smiling this picture remind me of their intensity. wow he has so much character. awesome photo! I saw this guy before. He reminds me of the painter at Calvin Klein, Milan. Another beautiful portrait. So much history and life is spoken in this photo. May we all live long enough to showcase such wisdom! I miss your posts like this. face with character makes a beautiful picture. This photo is incredible — you've captured the essence of this man. I want to meet him and listen to any story he has for me! Oh, what stories I bet he can tell. And most appropriate in black and white! He is so so charming…very hugable!!! Personally, your best picture yet. And I look at your blog daily. he's wonderful!! reminds me of my great grandfather – they have similar features!! did you find out about him – is he Greek? he sure looks it! Wow! Amazing portrait, he looks so kind and all-knowing. Wow, great photograph! A lot of personality and character in this photo. What a warm, likeable face. Great photo! 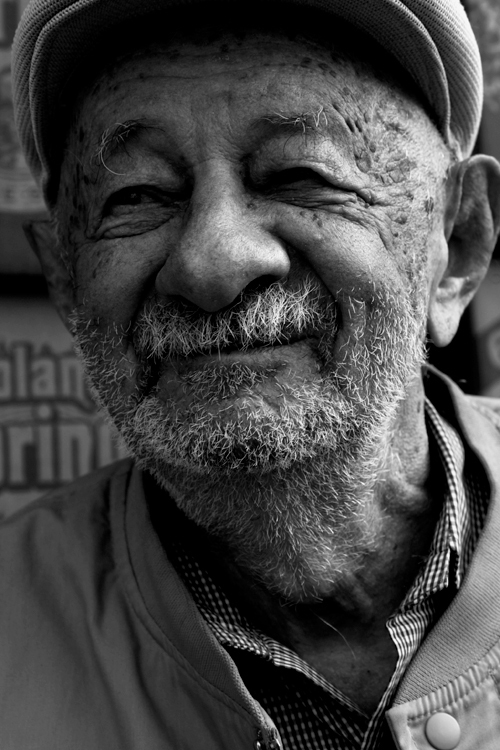 You've definitely captured a strong aspect of this man's identiy; he looks so approachably friendly, oozing charm and a refreshing sense of the beauty in the regular. his eyes smile, its beautiful. Wow, great photos and great details. I'd love to know his story. this is even more beautiful than any of your fashion photographs. I love that you photograph people we can often overlook. Personally, I love looking at old people like antique tapestries/textiles. Please come to Montreal soon. Is this a reworking of the same photo? This is beautiful in so many ways. Thank you for posting this. i looooooove him! =) nice pic! Fantastic face, fantastic portrait. A great example of how a picture is worth a thousand words. this is lovely! just perfect! Lovely man, lovely photograph. I think you've really captured this man's spirit. There's nothing more appealing than an online picture of someone that will most likely never see it on the internet. This is beautiful! But can you dodge the eyes a little? I would love to see a little more detail there. No need to parrot what all others are raving about already… Just want to add that you really have become such an influence on so many people– casual and artistic snappers alike with your simple, unpretentious and dynamic portraits; aristocrats, socialites, fashion royalties, art school kids, eccentrics, and this gentleman, are all equally regal and beautiful. It's all about the individual's style. this photograph is seriously outstanding!! so perfectly shot, i may say. i wish i could do photography just like you…. The face of a man straight out of a Hemingway novel. this is how an "inner glow" looks like. lovely. Your blog is about to become a very interesting one. I was actually kind of bored lately; all your pictures depict very good stylished people…all very well taken. And with this picture, you're going to a new direction, a new level. Keep up the very good work. Love the photo. Great presence! Deeply admire the photography of a person in their clothes, not clothes on a person. I love the small-gingham shirt. Good to see he is still around and still smiling. He has this amazing sense of joy to his expression. Love this! Tells more than a thousand words! Ditto on the Hemingway comment; I also love how you've brought out the texture of his beard. The salt & pepper contrast is striking! this picture doesn't need many words to express its beauty. What a charismatic face! he seems to get wiser and more interesting as he ages. love the hat and shirt! Great face-porcupine scruff! Reminds me a bit of the style of chiaroscuro in Strand's images you posted from the Hebrides. Amazing how expressive his eyes are, without even showing the whites. The expression is everything, and the way you've captured it (again! I loved that photograph of him you took yonks ago) is wonderful. I love that you've been highlighting people more and more in your photos. The portraits are a great glimpse into more than just their attire — I love it. Thanks! he has such character. One of the most captivating faces you've posted thus far–bravo! Beautiful photo. The way you captured and conveyed depths and textures (the crosshatched wrinkles near his eyes, the bristle of the beard, the ribbing of the jacket collar, even the weave of the fabric of the cap) is astonishing… it draws the eye in and echoes the idea that this man has depths of experience and heart. This photo is incredible. He looks so joyful and serene at the same time. The details in this are stunning. you've everything said :) and you are all right, he is such a kind of cute. It is a wonderful picture actually, it's so natural and strong character. However the tone is too dark maybe you could add some more lighting. this man has got real stories to tell! those photos are great, i can learn photography from here.